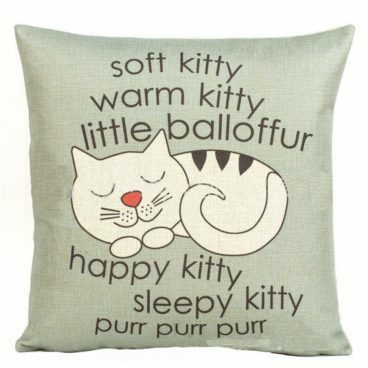 "Soft Kitty Warm Kitty..." Cushion Cover Just $2.71 Ships FREE! You are here: Home / Great Deals / Amazon Deals / “Soft Kitty Warm Kitty…” Cushion Cover Just $2.71 Ships FREE! “Soft Kitty Warm Kitty…” Cushion Cover Just $2.71 Ships FREE! If you are a fan of “The Big Bang Theory”, you know this little song might make you feel better! Order the “Soft Kitty Warm Kitty…” Cushion Cover for Just $2.71 and it Ships FREE! Factory Outlet. Approx Size: 18 * 18 inches(45 * 45 cm). Happy Sleepy Kitty Print throw pillow cover. Made of durable cotton linen cloth material. It can dress up the room, bringing warm and show personality. Soft, Hidden zipper allows easy insertion or removal of a cushion, High-end quality and workmanship. Fashion and elegant design. Reminder: This is just one Cushion cover,Pillow insert are not included.